This English guittar is owned by John Wesley's Chapel in Bristol, England and is known as 'Sarah Wesley's guittar'. Sarah was married to John Wesley's brother, Charles, the hymnist. She tought music to her family in their Bristol home, which is now owned by the Chapel. The guittar is now displayed in John wesley's home. The purpose of the restoration was to preserve the instrument and make it presentable. There was no intention of making it playable, although that could have been done. A large number of cracks and splits were repaired and a new ebony bridge was made as the one with the instrument was the wrong size. The maker, Frederick Hintz, of Soho, London, was active from about 1756 to 1771. His label is visible through the sound hole showing the date 1757. 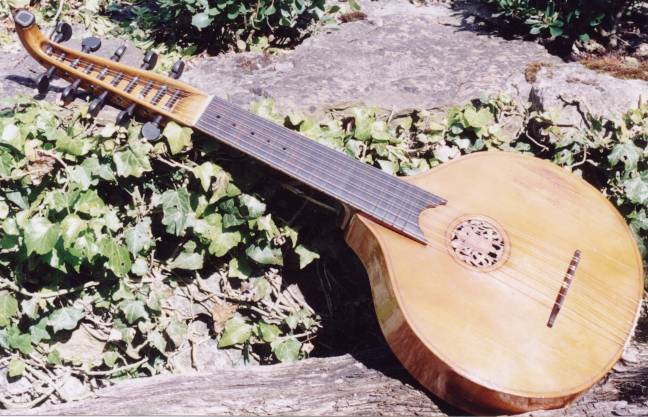 This is the form of the English guittar with turned wooden tuning pegs. 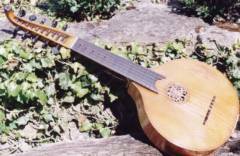 Other instruments have mechanical tuning systems as it is difficult to tune the wire strings. 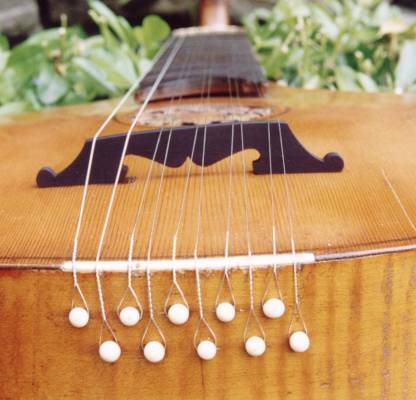 A side view of the guittar, the new bridge, ivory pins and detail of the pegpox.